A 65-year-old male, previously healthy was referred from another health-care facility on October 23, 2015, because of high total white cell count with 1 month history of fatigue and painless cervical lymphadenopathy. On examination, he was not pale not jaundice, not tachypneic. There is generalized lymphadenopathy (bilateral tonsillar, left supraclavicular, and bilateral axillary nodes). Vital signs include blood pressure 130/80, temperature 37.2°C, and pulse rate 88/min. cardiorespiratory examination was unremarkable. Abdominal examination showed no tenderness, no mass, and splenomegaly was felt 10 cm below the left costal margin. Complete blood count (CBC) was as follows: Hemoglobin (Hb) 12.7 g/dL, white cell count 77.5 × 10 9 /L, and platelet count 90 × 10 9 /L. 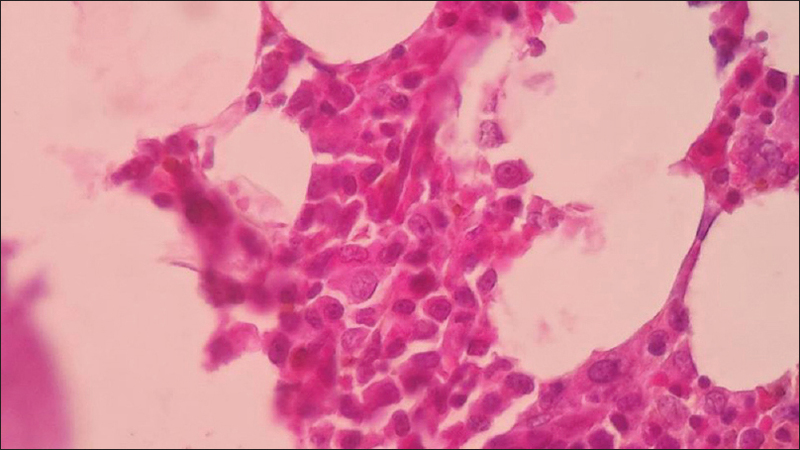 Blood film showed absolute lymphocytosis many small mature lymphocytes with many smudge cells are seen suggestive of chronic lymphocytic leukemia (CLL). Bone marrow study revealed hypercellular marrow with infiltration by small mature lymphocytes constituting 90% of all nucleated cells. The picture goes with lymphoproliferative disorder and immunophenotyping is recommended to confirm the diagnosis of CLL. The patient had been further investigated outside the country on November 2015, and flow cytometry on peripheral blood was done, which was reported as CD20+ B-cell CLL. 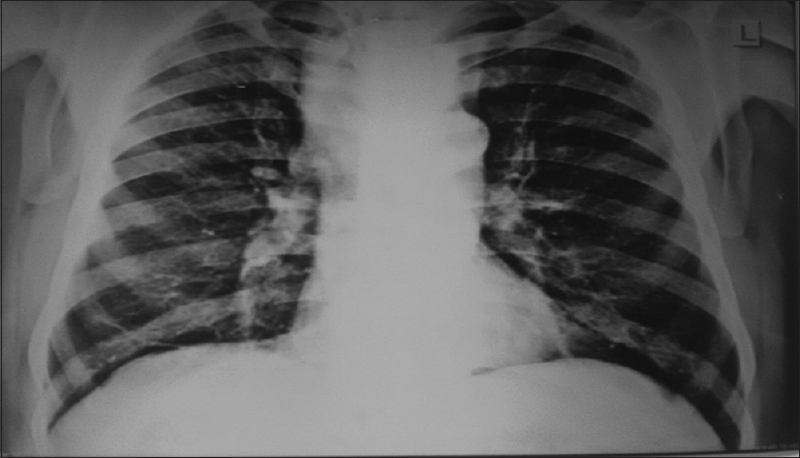 Chest X-ray showed possible mass as in [Figure 1]. Whole body positron imaging tomography-computed tomography was done and findings are seen in [Figure 2]. Staging workup revealed Binet stage C/Rai stage IV. He was started on chemotherapy with the bendamustine + rituximab (BR) regimen [Figure 3] together with uricosuric drugs and hydration and received his first cycle on November 23, 2015. 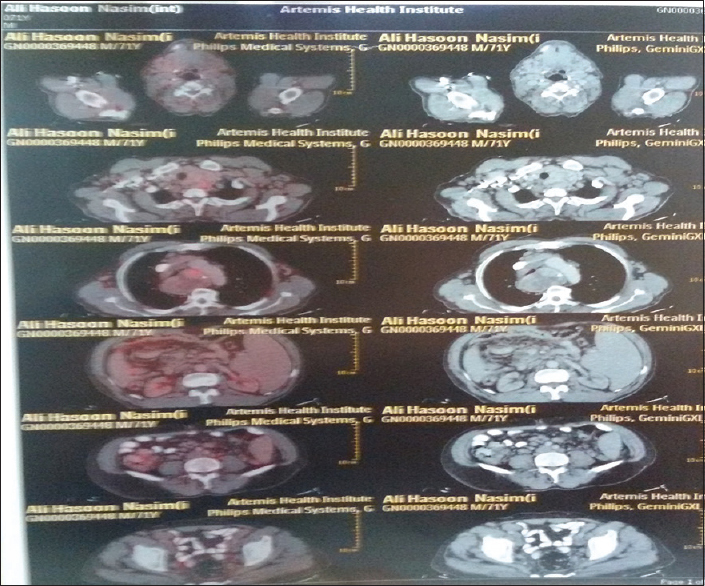 He showed good improvement to the first cycle of chemotherapy with rapid reduction in the size of the nodes, splenic size, and total white cell count and advised to receive the second cycle in Iraq on December 24, 2015. 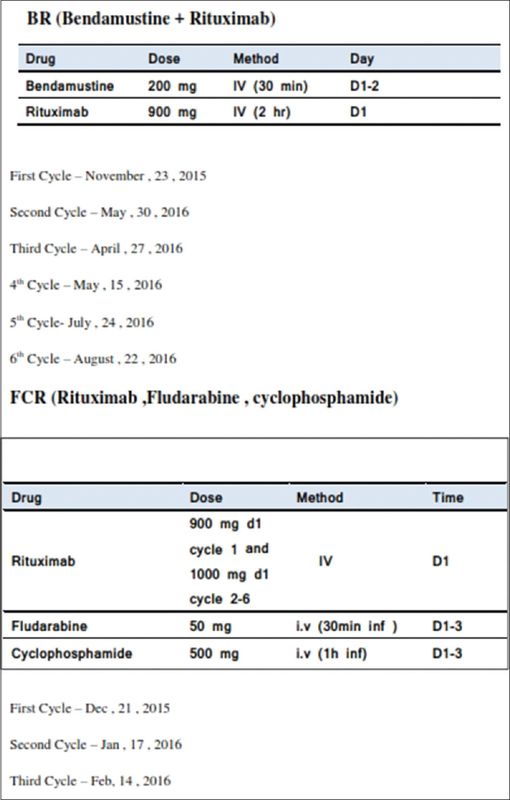 In our department, the chemotherapy regimen was changed to fludarabine, cyclophosphamide, and rituximab (FCR) regimen [Figure 3] because of unavailability of bendamustine in our facility and received the first cycle of FCR in the scheduled date. On February 2016, the patient presented with progressive pallor and shortness of breath. CBC revealed white blood cell (WBC) 3.7 × 10 9 /L, Hb 5.5 g/dL, and platelets 50 × 10 9 /L. Reticulocyte count was 1%, and direct antiglobulin test (DAT) was negative. Then the patient was admitted to the hematology ward of Merjan Teaching Hospital on frequent intervals to receive red cell transfusion, but the Hb level failed to rise appropriately after transfusion. This was attributed first to the bone marrow failure from the effects of chemotherapy, hence, bone marrow aspiration and biopsy after the third cycle of FCR was done revealed hypercellular with diffuse lymphoid cells infiltrate, and the patient is not in remission. At this point, a plan is made to change the chemotherapy regimen to BR again, and the first cycle was given on March 30, 2016. However, anemia persisted, and the patient was re-evaluated again on May 2016, and the CBC was as follows: WBCs 4.5 × 10 9 /L, Hb 6.1 g/dL, and platelets 69 × 10 9 /L. Absolute reticulocyte count was <0.03%. DAT was negative. Bone marrow aspiration was cellular with erythroid hypoplasia and few erythroblasts and bone marrow biopsy was hypocellular for the patient's age with preserved architecture with many granulocytic precursors' adequate megakaryocytes and few erythroid precursors with little nodular mature lymphoid cell infiltration [Figure 4]. The final diagnosis was CLL not in remission with pure red cell aplasia (PRCA). Epstein-Barr virus (EBV) and cytomegalovirus (CMV) viral titers are within the reference ranges (EBV 0.14 IU/mL IgM (reference range: Negative <0.6), 0.1 IU/mL IgG (reference range: Negative <0.8); CMV 0.05 IU/mL IgM (reference range: Negative <2.0) 0.7 IU/mL IgG (reference range: Negative <2.0). Polymerase chain reaction for parvovirus B19 was unavailable in our facility. Based on these findings, the patient was started on cyclosporine A (Neoral, Novartis) ® 5 mg/kg/day in two divided doses with monitoring of renal, liver function, and serum electrolytes and the patient continued on BR regimen in the scheduled dates. Follow-up CBC done in June 2016 was as follows: WBCs 3.7 × 10 9 /L, Hb 8.6 g/dL and platelets 50 × 10 9 /L. Reticulocyte count was 10%, and the patient became transfusion-independent. Serial follow-up CBC was shown in [Table 1]. After finishing chemotherapy in August 2016, the patient was evaluated for remission. CBC: WBCs 1.1 × 10 9 /L, Hb 11.4 g/dL, and platelets 83 × 10 9 /L. Bone marrow study showed hypocellular marrow with active erythropoiesis and normoblastic maturation, and the patient was in complete remission (CR) [Figure 5]. The patient was well when seen in the next monthly visit with CBC showed WBCs 1.7 × 10 9 /L, Hb 11.9 g/dL, and platelets 107 × 10 9 /L. Reticulocyte count was 3%. Renal, liver function, and serum electrolytes were normal, and serum cyclosporine was in the therapeutic range. Awan FT, Byrd JC. Chronic Lymphocytic Leukemia. In Kaushansky K, Prchal JT, Press OW, Lichtman MA, Levi MM, Burns LJ, et al. William's Hematology, Ninth Edition. McGraw-Hill Education 2009; USA: 1527-52. Johnston JB, Seftel M, Gibson SB. Chronic lymphocytic leukemia. In: Greer JP, Arber DA, Glader B, editors. Wintrobe's Clinical Hematology. 13 th ed. USA: Lippincott Williams and Wilkins; 2014. p. 1888-928. Gribben JG. How I treat CLL up front. Blood 2010;115:187-97. Lin TS, Awan FT, Byrd JC. 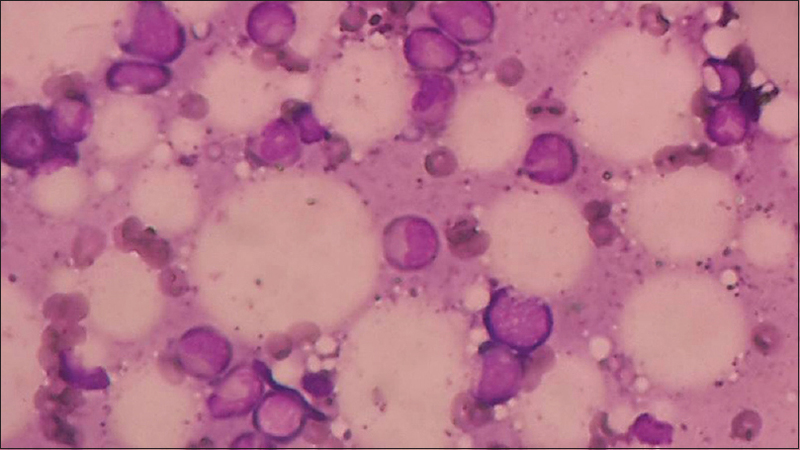 Chronic lymphocytic leukemia. In: Hoffman R, Benz EJ, Silberstein LE, editors. Hematology Basic Principles and Practice. 6 th ed. USA: Elsevier Inc.; 2013. p. 1170-91. Visco C, Barcellini W, Maura F, Neri A, Cortelezzi A, Rodeghiero F. Autoimmune cytopenias in chronic lymphocytic leukemia. Am J Hematol 2014;89:1055-62. Ghia P, Scielzo C, Frenquelli M, Muzio M, Caligaris-Cappio F. From normal to clonal B cells: Chronic lymphocytic leukemia (CLL) at the crossroad between neoplasia and autoimmunity. Autoimmun Rev 2007;7:127-31. Moreno C, Hodgson K, Ferrer G, Elena M, Filella X, Pereira A, et al. Autoimmune cytopenia in chronic lymphocytic leukemia: Prevalence, clinical associations, and prognostic significance. Blood 2010;116:4771-6. D'Arena G, Cascavilla N. Chronic lymphocytic leukemia-associated pure red cell aplasia. Int J Immunopathol Pharmacol 2009;22:279-86. Diehl LF, Ketchum LH. Autoimmune disease and chronic lymphocytic leukemia: Autoimmune hemolytic anemia, pure red cell aplasia, and autoimmune thrombocytopenia. Semin Oncol 1998;25:80-97. Cobcroft R. Pure red cell aplasia associated with small lymphocytic lymphoma. Br J Haematol 2001;113:260. Cortes J, O'Brien S, Loscertales J, Kantarjian H, Giles F, Thomas D, et al. Cyclosporin A for the treatment of cytopenia associated with chronic lymphocytic leukemia. Cancer 2001 15;92:2016-22. Marmont AM. Therapy of pure red cell aplasia. Semin Hematol 1991;28:285-97. Chikkappa G, Pasquale D, Zarrabi MH, Weiler RJ, Divakara M, Tsan MF. Cyclosporine and prednisone therapy for pure red cell aplasia in patients with chronic lymphocytic leukemia. Am J Hematol 1992;41:5-12. Ghazal H. Successful treatment of pure red cell aplasia with rituximab in patients with chronic lymphocytic leukemia. Blood 2002;99:1092-4. Narra K, Borghaei H, Al-Saleem T, Höglund M, Smith MR. Pure red cell aplasia in B-cell lymphoproliferative disorder treated with rituximab: Report of two cases and review of the literature. Leuk Res 2006;30:109-14. Mouthon L, Guillevin L, Tellier Z. Intravenous immunoglobulins in autoimmune- or parvovirus B19-mediated pure red-cell aplasia. Autoimmun Rev 2005;4:264-9. Itälä M, Kotilainen P, Nikkari S, Remes K, Nikoskelainen J. Pure red cell aplasia caused by B19 parvovirus infection after autologous blood stem cell transplantation in a patient with chronic lymphocytic leukemia. Leukemia 1997;11:171. Rossignol J, Michallet AS, Oberic L, Picard M, Garon A, Willekens C, et al. Rituximab-cyclophosphamide-dexamethasone combination in the management of autoimmune cytopenias associated with chronic lymphocytic leukemia. Leukemia. 2011;25:473-8.